When Clyde Edgerton was four years old, his mother took him to a local airport to see the airplanes. Eighteen years later, she would take him to the same airport to catch a plane to Texas for Air Force pilot training. She’d been his first passenger when he got his aviator’s license. She’d supported his decision to join the Air Force. All the same, she wished he’d kept up his piano lessons instead. But Truma Edgerton’s only son had fallen in love with flying, and had fallen hard. His plan was to pilot the newest, sleekest, fastest aircraft available. 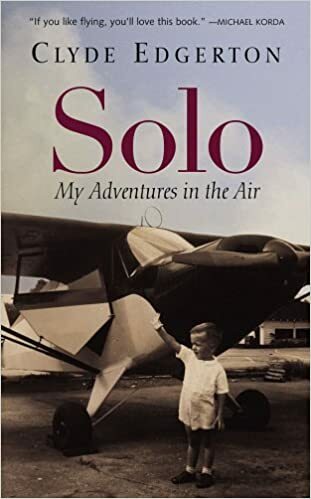 The first time he soloed in a jet, he felt “a strange pride and power.” By then, the only access to the cockpits of fighter jets was via the war in Vietnam. So he spent a year flying combat reconnaissance over the Ho Chi Minh Trail, and he won the Distinguished Flying Cross. Back at home, he took up another passion—writing. By and by, he bought himself his own airplane, a Piper Super Cruiser that he named Annabelle. Now, thirty years after Vietnam, Clyde Edgerton looks back at his youthful passion for flying, at the joy he took in mastering it, at the exhilaration—and lingering anguish—of combat flight. Solo is a story told with empathy and humor—and with searing honesty that will resonate with every pilot who remembers the first take off, the first landing, the first solo. For those of us who always choose the window seat, it’s a thrilling story to experience vicariously. Captain Dunning was assigned to a new student and I was assigned back to Captain Coleman—Mr. Big, my original T-37 instructor, who’d turned me over to Captain Dunning. Captain Coleman, I’d heard, was a screamer. On our third or fourth flight, I was flying an instrument approach. I became preoccupied with my altitude and got off my heading. Captain Coleman suddenly screamed, “What the hell are you doing, Edgerton?” He grabbed the hose to my oxygen mask and squeezed it shut. I couldn’t breathe. FLIGHT 1. AFFECTED ENGINE CONDITION LEVER—FEATHER & FUEL SHUT-OFF. 2. FIRE LIGHT—PULL. 3. FIRE EXT—AGENT. 4. If still on fire —EJECT OR LAND IMMEDIATELY. 5. Failed engine FUEL EMERG SHUTOFF—SHUT-OFF. We caught a van and rode to headquarters for a preflight briefing (intelligence and weather) lasting from 4:20 to about 4:50. Then we rode a van to the flight line, found our airplane, and had about thirty minutes for a thorough preflight check. I hadn’t thought about giving Harley extra time. you run the risk of dying for a cause, it may not be easy to examine the cause. So we immunize ourselves against the deaths of innocent people—civilians and soldiers. I hear the voices of old soldiers, old friends even, speaking to me: You’re a softy. People die. War is hell. It was never hell for me except for a short while here and there. I was just a pilot. And I loved to fly.